Have you ever looked back over a campaign, admitting the results weren’t as expected? Followed closely by the imminent conversation with your colleagues around the pending question: why? We chew on data, we interrogate timing issues, we critique creative or perhaps copy or budget spend but no matter how it’s sliced, the outcomes tilt unfavourably against the efforts of our marketing craft. The core truth is: most digital campaigns render marginal results not because of timing, creative, copy or even budget. Campaigns fail because we enter the battlefield of digital in the wrong way. Since the early 1900’s when marketing began to take shape within academic fields, it was seen as a discipline of telling a story to an audience with a desired outcome (buy something, promotional offer, trade in, etc.). This approach developed by E. Jerome McCarthy is commonly referenced as the 4P’s (Product. Price. Promotion. Place). 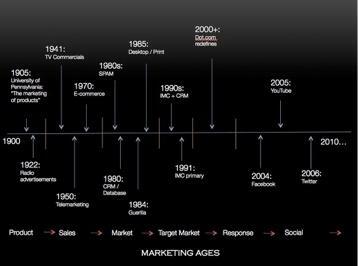 It took hold and became the fundamental thrust of marketing for the next century. Marketers continue to use dated strategies and tactics in a totally new environment. It’s like the classic metaphor: are they bringing knives to gun fights? Consider for a moment pre-gunpowder warfare: Two sides, horses, archers, foot soldiers all lined up and when the battle started, they’d advance and crash into each other. Then gunpowder entered the scene. We then witnessed how military generals had to go through a learning curve. At first, even with new weapons at their disposal, namely guns and canons, the two sides would still line up and act as if they were still using bows and arrows. They would advance towards each other unleashing the new weapons but, in the same old fashion way. That’s what they knew worked, from years of experience and battles. War doesn’t happen like that anymore. War strategies have changed because the WAY wars are fought changed. The WAY wars are fought changed because gunpowder changed the game. Digital is the ‘gunpowder’ of marketing: it’s changed the game. 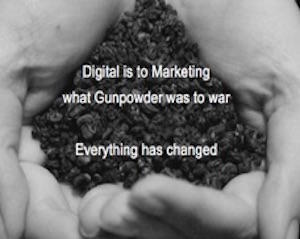 As gunpowder changed the way we go to war, digital has changed the way we go to market. It’s tough to shift over 100 years of practice but let’s face it: it’s a new world and marketers need to help clients learn the new WAY of dialogue-based, brand engagement. In my Mastering Digital Strategy courses, I spend over an hour unpacking how Digital has radically changed how marketing is done. To summarize, digital is NOT about enabling past brand actions in a different media. Digital is a two-way dialogue between a brand and its customers whereby marketers are responsible for ushering in a new model to brand behavior. Yes, gone are the ages of Product, Sales, Market and so on; today’s age is the Dialogue Age – the age of instant, two-way communication and it demands a new WAY: new strategies, methods and tactics. Has the end objective changed? Absolutely not. You are still charged to achieve changed behavior of a consumer towards a brand. Has the WAY in which you realize this changed? Absolutely. NEW WAY: Focusing on how to inform (dialogue age engagement focus). To start, you must focus on developing client brands into trusted authorities, and through digital media, understand how consumers engage with, speak to and yes, expect to be listened to by brands. Have a hard look at your digital strategy: if it’s filled with quivers of 4P arrows and not the dialogue ammunition of today, don’t be surprised if the battle turns ugly…and of course, you’re going to have to answer the question: why? Yes, I’m interested in learning more about Marketing in a Digital World during the Dialogue Age. © 2019 Emissary Insights LLC. All rights reserved.